One of the markers of big businesses, especially publicly traded ones, is they have many capital sources. Equity capital from the founder(s) and investor(s). Retained earnings - profits left in the business. Borrowed funds, typically from a financial institution. The lion’s share of all small business capital comes from # 3, bank loans. Consequently, since small businesses generate over half of GDP, it’s easy to see that the health of the banking industry, and its receptiveness to small business, is vitally important to the U.S. economy. Periodically, we poll our audiences about their banking relationships, which we did again recently. We asked, “Which example best describes your recent experience with a business loan from a bank?” and here’s what we learned. Added together, approximately two-thirds of our small business respondents are confident they have the ability to borrow capital when, and if, they need it. Sadly, about one-third of our audience is still struggling with their capital requirements. 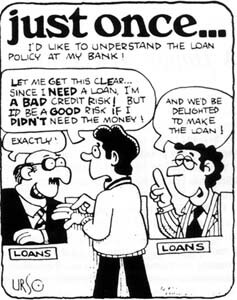 Ten percent said, “We need a loan, but can’t find a bank that will loan to a small business,” and 27% reported, “We need a loan but haven’t tried because we don’t think we can get one.” In a healthy economic expansion, these two groups should total no more than 10% to 15%. There are a number of economic and political issues making up the loose gravel that the U.S. economy is currently standing on as it struggles to find growth footing. But an improving banking picture for small businesses is definitely a good sign of economic healing and expansion potential. Every small business needs a good banking relationship, so keep trying until you get one. But remember, the perfect form of capital is retained earnings, because it is profits, produced from sales you make to customers, that you were disciplined enough to leave in the business. Retained earnings will make your banker very happy. I talked with Mike Menzies, President and CEO of Easton Bank & Trust in Easton, Maryland, recently about the key elements of a successful banking relationship. Click here to listen or download our conversation. In the spirit of Valentine’s Day, here are the “Top 10 Reasons To Love Small Business,” as from our friends over at the Office of Advocacy of the SBA. 10. Small businesses make up more than 99.7% of all employers. 9. Small businesses create more than 50 percent of the nonfarm private gross domestic product (GDP). 8. Small patenting firms hire 43 percent of the high-tech workers and produce 16.5 times more patents per employee than large patenting firms. 7. The 27.5 million small businesses in the United States are located in virtually every neighborhood. 6. Small businesses employ about 50 percent of all private sector workers. 5. Home-based businesses account for 52 percent, and franchises are 2% of all small businesses. 4. Small businesses make up 97.5 percent of exporters and produce 31 percent of all export value. 3. Small businesses with employees start-up at a rate of over 500,000 per year. 2. Four years after start-up, half of all small businesses with employees remain open. 1. The latest figures show that small businesses created 65 percent of the net new jobs over the past 17 years. It’s true: Small business is the heart of the American economy, and it’s why I really do love small business owners. This article is about three letters to small businesses. The first letter was born in the 1950s, when the quality ideas of an American, Edwards Deming, reversed “Made in Japan” from a metaphor for cheap to quality. During the 1980s, after American industry had lost competitiveness with Japan, quality processes like ISO and Six Sigma were adopted and “Made in America” returned to prominence. By 1990, now with their in-house quality act together, big businesses realized they needed similar commitments from integrated vendors. That’s when small businesses started getting letters from customers requesting evidence of their quality process – or no new contracts. The seed for the second letter was planted by computer programmers in the 1960s. To conserve expensive data storage, program date codes were written with six digits, as in 121565, for December 15, 1965. They didn’t realize they had created the Y2K ticking time bomb. Around 1995, experts started worrying that when the clock ticked midnight, January 1, 2000, zillions of lines of date-sensitive computer calculations would fail by going back a century – 010100 would be January 1, 1900 – instead of forward to 2000. Consequently, the codes in millions of programs had to be fixed. And by 1998, small businesses started getting letters from their larger customers requesting evidence of their “Y2K compliance” – or no contracts with eight-digit dates. The third letter was born in the middle of the 20th century, when we started realizing that the solution to pollution was not dilution. Since then, environmental stewardship has evolved from not polluting to sustainability. Sustainability means doing more with less, including making waste useful – especially water. It’s the right thing to do, but businesses are also learning that sustainability can be profitable and good for public relations. The sustainability letter hasn’t been sent yet – but it’s coming. Within the next five years, small businesses should expect to hear from big customers about their sustainability plan. And like the quality and Y2K letters, your first motivation will be to keep a customer. Start thinking about the resources your business uses, including energy, consumables, production waste – especially water. Establish programs for recycling, reusing, conserving, etc., and document your execution. So when you get that first “Sustainability Letter,” you won’t look like a deer in the headlights. Sustainability is good business, good public relations and good karma. Small Business Advocate Poll: To Keystone or not to Keystone? Construction of the Keystone Pipeline to bring Canadian crude oil to U.S. refineries is being debated in Washington. What do you think? Let’s get one thing out of the way first: The United States of America, which consumes more carbon fuel per capita than any other nation on the planet, has NO national energy plan. Not now, not ever, nor is one even being considered. So, when the Keystone Pipeline - which would bisect the U.S. by carrying Canadian crude oil to Houston, Texas - was proposed, it’s not like it either fit into or violated some kind of a grand plan. But it does push the buttons of a lot of people and create a few strange bedfellows. Environmentalists hate it because: 1) it might break and contaminate the environment; and 2) they don’t like anything that promotes the use of more carbon fuel. Unions like it because: 1) it creates thousands of jobs they hope will be union jobs; and 2) they desperately need more union dues from those jobs. The Obama administration hates it because: 1) they only like green jobs and crude is either black or brown, but never green; and 2) they made the calculation that they can get more votes by ticking off the unions than the environmentalists. The petroleum industry likes it because: 1) they like anything that puts the word “more” in front of “oil”; and 2) it ticks off the environmentalists. The marketplace likes it because: 1) it will create thousands of jobs; and 2) and we desperately need more new jobs. Most members of Congress like it because: 1) it creates jobs and, unlike the Obama administration, they don’t care what color jobs; and 2) they can take credit for creating jobs. So, that leaves only one U.S. group to poll: small businesses. And when we asked our small business audiences what they thought about the Keystone Pipeline, here’s what we learned. Consequently, if you just do the math, clearly more groups want the Keystone Pipeline than don’t. And since I believe that small business votes should get double weight, the pipeline should be a slam dunk. But since Barack Obama has that Oval Office thing going for him, which he used last week to reject the pipeline, it looks like the Keystone Pipeline is in trouble. Stay tuned. Yesterday on my radio program I talked more about why we need the Keystone Pipeline. Take a few minutes to listen or download and leave your thoughts.